Instant Imprints Langley, BC | Custom T-Shirts, Embroidery, Signs and More! At Instant Imprints Langley, our customers come to us when they want to be more visible to their customers. We create that visibility five different ways: Branded Apparel (embroidery), Signs & Banners, Promotional Products, Custom T-Shirts and Print Services. We have ordered a variety of products over the years; Signs Banners T-shirts Uniforms and much more. We have always been pleased with the quality and the service that we have received. Every business wants to increase its impact with the world around them. Your Instant Imprints here in Langley is your best source for promotional products designs to take your brand to the next level. Whether you’re looking for custom t-shirts, printing services, promotional products, custom banners or branded embroidery items, Instant Imprints has what it takes to help your brand increase its visibility. By combining a global vision with a local Langley touch, Instant Imprints gives you the best service around with a personalized attention to detail. Just ask Siri, Alexa, or your Assistant, “where can I create custom t-shirts near me?” and you’ll find Instant Imprints in Langley at the top of the list! Promotional products can be used in a way that engages your audience and connects them with your brand. By branding promotional items that are relevant to your customer base, you can make sure your brand is integrated into their daily lives. By branding a wide range of promotional goods, your business can make the multiple impacts necessary to becoming a household name. Whether you’re looking to promote locally to those around Langley, or whether you’ve set your sights to BC as a whole, professionally branded promotional items can be your ticket to better business visibility. Throughout Canada, you’d be hard pressed to find a major brand that didn’t sell a custom t-shirt. When you want to spread your brand to the global scene, custom tees can bring your logo to the corners of the globe. In addition, you can make your mark on the local Langley market by giving out custom t-shirts as prizes or putting them up for sale so that loyal customers can show their support. When you want to take your apparel to the next level of style, our custom embroidery service combines elegance and durability to customize virtually any garment. Whether they’re on foot or in the car, there’s no better way to reach the attention of passersby than with a professional sign or banner. 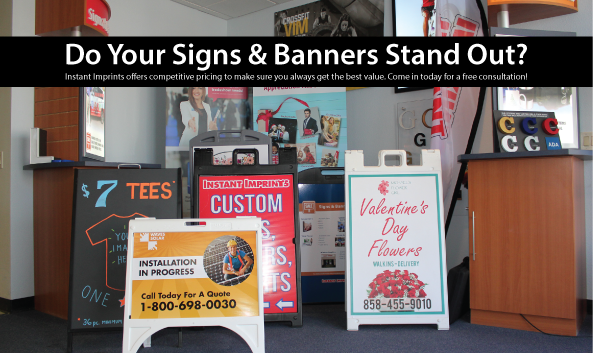 When you need to grab Langley’s attention, our custom banner service can bring you to the forefront of the city scene. On top of all this, our print shop is one of the best in BC! Stop by our 202nd Street Showroom, give us a call at (604) 510-5192 or request a quote online to get started today.